The guest editor for this Alliance special feature is Chet Tchozewski, president of Global Greengrants Fund. With the global financial situation under the spotlight, many organizations are having to rethink their grantmaking strategies. What place will small grants have in future funding plans? What may seem like a drop in the ocean now can have long-term effects that may go way beyond the original scope of the grant, says Tchozewski. 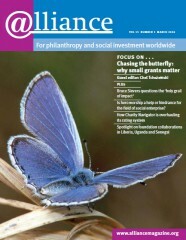 The feature includes contributions from individuals and organizations around the world with experience of making small grants. These include Wangari Maathai, Marion Rockefeller Weber, Jacqueline Delia-Brémond and Nonette Royo. Both Ezra Mbogori and Stephen Pittam focus on small grants and social justice. Other articles look at Mama Cash’s recent move towards making a broader range of grants and Global Fund for Children’s new approach to measuring impact. The March issue of Alliance also includes the first in a series of columns focusing on philanthropy advice, a report on the extraordinary response to the Haiti earthquake, and further articles, reviews, letters, opinion pieces, and global updates. Into the chamber of wishes?